What if it's too wet to wade through tulips? April is the month to check out the vast fields of tulips blooming across Washington State’s Skagit Valley. Bright rows of flowers in every color stretch as far as the eye can see. On a sunny spring day — or even on a gray overcast one — It’s really worth the short trip north of Seattle to behold the beauty. But what if it’s raining. Like really, really raining? Maybe the day begins with promise — sun streaming, birds chirping, so you set off for the tulip fields. But what if, as can happen, the sun gives way to not just clouds but rain. Rain that discourages tiptoeing through the tulips in anything but waders and full-on rain gear? You’ve already navigated I-5 north toward Mt. Vernon, La Conner, and Burlington, so what else is there to do up there? In Mount Vernon, you’ll find a sweet little town with food and shops, including KidsStuff, a toy store. 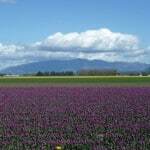 For a true taste of the valley, visit Samish Bay Cheese, a working farm and farm store. Hours are 10 am – 4 pm Mondays-Saturdays, Noon-4 pm Sundays. 15115 Bow Hill Road, Bow. 360-766-6707. If it’s all about the tulips for you, note that the festival runs the entire month of April, with flowers blooming in the fields mostly between Mount Vernon and La Conner. From Mount Vernon, head west along McLean Road for best viewing. You can also visit Roozengaarde and Tulip Town. Mount Vernon’s Downtown Street Fair runs April 20–22, featuring vendors, entertainment, a juried arts and crafts fair, and kids’ fun. Find maps, a schedule of events, and much more detail at tulipfestival.org.